Click here to subscribe to my email newsletter with free updates about my upcoming novel. I rode the train back to my apartment in Brooklyn, clutching my wrinkled stack of commented stories, thinking about what my teacher had said. The story was a disaster; but I knew there was something there, the seed of a story, the characters and ideas I’d been mulling over, wrestling with, for most of my life. Back in the apartment, I pulled out my 1935 Royal typewriter, a graduation present from my parents. Sometimes when the blinking cursor on a blank page on my computer felt too overwhelming, I turned to this ancient, creaking machine to get my writing done. Every key press was an effort. It felt like I was really doing something heroic. I looked out the window, let the quiet of the afternoon fill me, and I wrote a page. It was the same character I’d been writing about in my failed short story, but now the central problem of her life was laid bare, and Boston was wrapped up in it too, those long trips on the train, those muddy backyards and strangers walking by with their coat collars turned up. This time, the first page of the story was an open door into everything I wanted to say about belief, about sensuality, about family and devotion and their hard irreconcilability. That first paragraph got tweaked and shuffled around a bit from draft to draft, but in the final work, it’s still there — and all the energy and mood, the promise of it, was what kept me going through the years it took to reach this story’s completion. This month, I’m off to the AWP writers’ conference, which is always a huge jolt in the arm for me; it’s tremendously inspiring to learn of others’ projects, successes, and failures, and to re-connect with writers I’ve met from around the country. 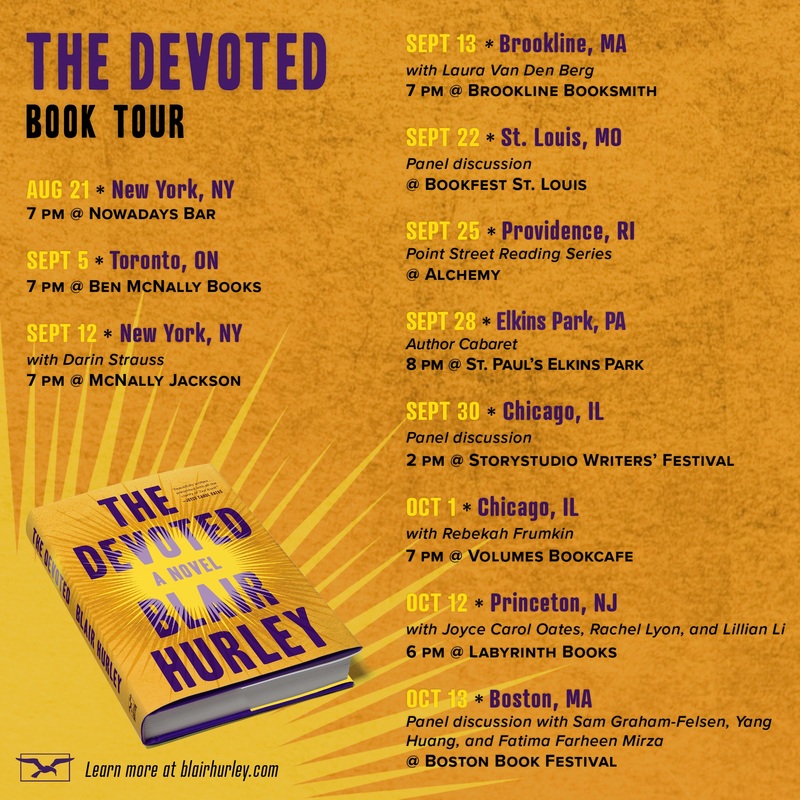 Coming soon will be some of the first scheduled events for The Devoted — so stay tuned. I’m pleased to report that I’ve had several successes this month with new short stories. “A Night Odyssey” was a finalist in Glimmer Train’s Fiction Open. Because the world of “These Things Happen Here”—an urban community college classroom—is so familiar to me, I was prepared not to be surprised by the story. How wrong I was. In fact, what was most impressive to me about this story is the way that the author constantly takes risks, writing with great honesty about a main character who is vulnerable and wants what is best for his students but is in way over his head. The unspoken secret of the classroom is that sometimes teachers dislike their students, and this author goes there also, as well as into the complicated relationship between art and revenge. The ending is complex and spot on. Like all great stories, this one stayed with me after the first reading and the second, but the meaning kept shifting, changing and evolving. “The Deconstruction” was shortlisted for The Masters Review Anthology. I’ve also been selected as a resident at the Kimmel Harding Nelson Center for the Arts and as a scholar at Sewanee Writers’ Conference. I have a new piece of flash fiction appearing in the March issue of the Tahoma Literary Review. I also wrote a blog post for these fine folks about the importance of letting go of the first page. Read an excerpt below, and read the entire article here. The blank page of a new story can be terrifying. Even if an idea is fresh and vivid in my mind, I still find myself looking at that first empty page warily as someone stepping out onto a frozen pond, wondering if I can build a structure that will hold me up, marveling that I ever have in the past. Eventually, I begin — with tricks and prompts, or just by edging out into that space, testing the waters with either keyboard or pen. The first page of a story is delicate. It’s the page that gets you into the conflict, that helps you discover a character, that allows a writer to discover what she’s writing about. And for all those reasons, it’s often what must go. I see it again and again in my students’ work, and I see it in my own; somehow it takes a page to sink into the rhythm of writing, and to get used to speaking with that particular voice. So often my students write of their characters getting up and brushing their teeth; they write about the weather; they write about getting coffee. It’s only on the second page or so that someone knocks on the door, and the story really begins. when it’s time to look back at a story and revise, I’m stunned by how often cutting the entire first page dramatically improves a piece. Just try it! The drama of your story will emerge, sharp and vital, right out there at the front of the charge. This might be one of the most important edits you make in terms of publishing your story as well. As an editor of a small lit mag myself, I know how a strong first page can catch my attention — and how a weak first page can make even lovely writing that follows a hard slog. I’ll read past a weak beginning, but now the story is living on borrowed time; I’m looking for reasons to reject. With a vivid first page, I’m far more eager to read on. I’m excited to report that I’m now offering professional manuscript consulting. I’ve been helping writers with their manuscripts in many different ways as a college instructor and instructor at adult writing workshops for years, and now I offer such services in a private capacity. It’s a way for me to do something I really enjoy as part of my job — helping writers shepherd their manuscripts toward success. Since 2003, I’ve been offering tips, secrets, and techniques for improving your writing; now for a much more personal guiding hand on your story, you can hire me. I offer in-depth manuscript critiques, line-by-line story editing, and private writing coaching. You can visit my new editorial site to learn about the many ways I help writers, from query letter assistance to proofreading and more. Contact me today about preparing your manuscript for success. Readers, I must share with you an exciting new project that I’ve been working on along with my co-editor at Two Cities Review. We couldn’t be more excited about our newest venture, the Two Cities Review Podcast. From the beginning of our little magazine’s inception, we always knew we wanted to create a magazine that captured the complexity of modern urban life. That meant seeking out stories about bridging the gaps between dreams and reality, between geography and localness, between technology and human connection. We always wanted our magazine to be a media-rich publication, a digital experience that actually took advantage of its digital format. So a podcast was pretty much inevitable. The podcast as a form is experiencing a golden age these days; we’re surrounded by a great richness of story, delivered in a way that lets you listen at all hours of the day. And Two Cities Review, we knew, should be participating in that great urban flow of anytime, anywhere story. Our podcast will be a mixture of us and you. That is, you’ll hear from us each episode, talking about what it takes to create the issue; you’ll get insights from us into our editorial process, what makes us accept or reject a story, and why we do or don’t love a piece. We’ll answer your questions about being editors and writers and what we’re looking for. But the podcast will also be a dialogue with our magazine. We’ll share our authors, reading their poems and stories, and we’ll interview authors too, getting their special insight into the process of creating their wonderful work. We will be cheerleaders, enthusiasts, and discriminators. We will try to give you a little window into what it’s like to be a gatekeeper in the literary world, but we’ll also let your words sing. We plan to have a new episode appear on the website and iTunes (coming soon) every two weeks. It will give you a whole new dimension of the current issue, and a whole new dimension of understanding into the editorial process. Issue 7 of Two Cities Review is Here! IN THE FIRST YEAR AND A HALF SINCE WE BECAME A MAGAZINE, we have published poems, stories, essays and artwork by over 100 different authors, featured written and audio versions of creative work on our blog and run our very first prose contest. Having lived in several different cities, we realize that every city has its ups and downs. Whether it is the weather or the public transit or just the people you spent time with there, each city has its own unique blend of wonderful and gritty, inspiring and burdensome. For our first contest, we sought stories and essays that examined the underside of cities. We received submissions about shootings and natural disasters, inmates and family members, growing up and growing old. We are excited to share the winners and runners-up from our contest in this special “Cities Gone Wrong” edition of Two Cities Review. We have included some poetry and art that we received during the same submission period that also fit the theme. There’s much to be excited about at Two Cities as our magazine and website continue to evolve. We want to take advantage of all the forms of art that an online issue allows, so you can expect more use of audio and a soon-to-be-announced serial project. We can’t wait to present new visions of the literary city in upcoming issues. We hope to make our contest an annual event; thank you all for your support of our writers and our magazine. Readers, I’m excited to announce that a short story of mine, “Grimalkins”, is now available for download in Amazon’s online literary magazine, Day One. The story can be read on any Kindle or any Kindle app for iPhone or Android. I worked hard on this story, which is loosely inspired by my stay at an artists’ colony and the very interesting characters one meets there. Somehow the story ended up being about motherhood and the gulf that exists between young and older artists as well.